The day is coming when human beings will no longer need actual physical contact. If trends continue, we will be able to get it all from social media. Three MIT students have created the Like-A-Hug, a “wearable social media vest” that inflates whenever someone “likes” a photo, video or status update on your Facebook wall, “thereby allowing us to feel the warmth, encouragement, support, or love that we feel when we receive hugs,” according to inventor Melissa Kit Chow. Since hugs are intended to go both ways, the students also developed a means for users to return the favor by squeezing the vest and deflating it. This development comes on the heels of the Kissenger, a device that — despite its decidedly unromantic-sounding name — allows long-distance lovers to send virtual smooches. What’s the next logical product to emerge from this line of thinking? I don’t think I want to know. I’m also not sure I want a hug every time someone “likes” one of my Facebook posts. And no offense to my Facebook friends, but I’m not sure I want to give all of them the ability to give me a hug, virtual though it may be. I mean, I’m an affectionate guy, and I’m choosy about the people to whom I grant Facebook friend requests, but couldn’t we develop something a little less intimate? Say, a virtual chest bump or high-five? I’m no Luddite — I appreciate all the good things that social media can provide — but I believe I’ll stick to real hugs from real people, and only for worthy reasons. Not for posting a picture of what I made for dinner. 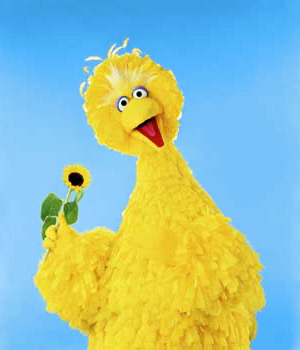 Who would have thought that the “Saturday Night Live” performer getting the most laughs this week would be Big Bird? But there he was, all 8 feet of his yellow plumage, seated next to “Weekend Update” segment host Seth Myers, yawning because he was up way past his 7 p.m. bedtime and nearly stealing the show from guest host Daniel Craig. Big Bird was retweeted more than 12,800 times and has been the talk of social media and news programs ever since. How is it that a puppet from a children’s show manages to remain so cool and so relevant — not with kids, but with grownups — after more than 40 years? The answers provide some good lessons for brands everywhere. Know your audience. Big Bird’s appearance on “SNL” wasn’t geared to children, most of whom share a bedtime closer to his. He knew his audience was the parents of those kids, many of whom grew up watching him on “Sesame Street” themselves. He also knew his audience would never forgive him if he delivered a line not in keeping with his character. Don’t take yourself too seriously. The whole reason Big Bird’s appearance worked is because Sesame Workshop, the nonprofit production company behind “Sesame Street,” has a good sense of humor about itself and was willing to play along — as long as the brand’s integrity remained intact. That’s the sign of a strong brand. Remain relevant. “Sesame Street” has managed to do so after all these years, even with many of the same beloved characters. A child-like 8-foot bird that’s active on Twitter? Now, that’s hip.